Foursquare recently announced that its Explore feature would be available to all visitors to its website, regardless of whether they were even a user of the service. Now, it’s bringing it to mobile devices and the first platform to get it is BlackBerry. The feature allows you to hit up the Explore section of Foursquare regardless of whether you’ve ever used it to check in once. The BlackBerry team apparently created a logged-out mobile version of the Explore section during a recent Foursquare hackday. Now, it’s the first platform that lets you download the Foursquare app and begin searching for local results without signing up for the service at all. Bringing the Explore feature to the web, and now mobile devices, without having to sign up at all reinforces that Foursquare has been building something more than a check-in service. It’s a recommendation engine powered by people on the ground, leaving tips, taking pictures, rating places and yes, checking in. Now everyone gets to use it, even if it never occurred to them to use it to track their visits. It’s an incredibly clever move and one that I think demonstrates exactly how powerful the app could be. I’d expect to see this sign-in free experience show up on more mobile platforms like iOS and Android fairly soon as Foursquare continues this transition. Foursquare recently announced a partnership with Opentable for reservations. It also updated its Android app to bring back the ‘nearby friends’ filter and simplified its Explore view with a better map, new search filters and more. The BlackBerry update is available now. 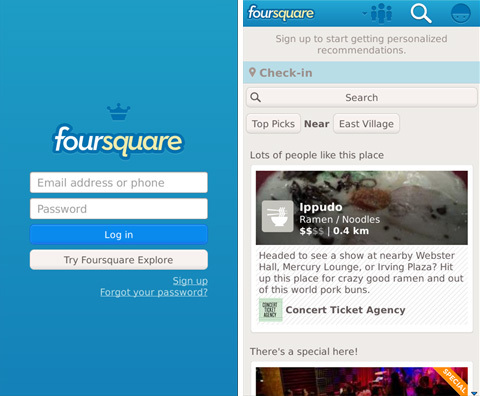 If you’re not a BlackBerry user, you can check out the new Explore feature on Foursquare’s website here.